Bobby Kotick wants people to know that he's actually a decent guy, but the Infinity Ward guys and Tim Schafer? They're totally jerks. 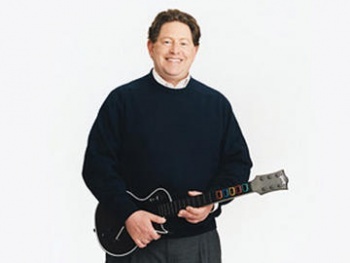 Activision CEO Bobby Kotick seems to be taking swings at just about everyone these days. Earlier, it was revealed that the man isn't above taking potshots at his competition in the videogame industry. Now, it turns out that he doesn't have a problem saying unkind things about people he's worked with, either. In the same interview with Edge Magazine that Kotick criticized game publisher Electronic Arts, he also discussed - vaguely - what happened with Infinity Ward's executives and - specifically - his feelings on Tim Schafer. According to Kotick, Infinity Ward's Vince Zampella and Jason West were fired because "We didn't have any choice!" Kotick didn't explain the specifics about what happened, but he painted a broad picture in which he appeared as the victim of some shady behavior and all but accuses the two executives of stealing from Activision. "The frustrating thing about that is," he told Edge, "the stuff that these guys did, I never would have expected them to do. We're a public company, we've got ethics obligations, and the things they did were... I would go to jail if I did them." "You can't use the company and the company's assets for your own personal benefit, and you can't use the leverage that you might have for personal benefit - you're not allowed to do that! And so we didn't have any choice." "It shook my belief in two specific people, who were my friends," Kotick said. Meanwhile, regarding Tim Schafer - specifically, how Schafer called Kotick names earlier this year - the CEO was less than kind. "The guy comes out and says I'm a prick," he said. "And do you know what? That seemed like a sensible thing to do. And it turns out, he was late, he missed every milestone, the game was not a particularly good game..."
Reading through the entire interview, it feels like Kotick is finally trying to do some damage control after years of being perceived as one of the principle villains of the videogame industry. Whether or not this attempt to repair his reputation pays off remains to be seen, but I'm not sure bashing a whole bunch of people is the best way to do it.